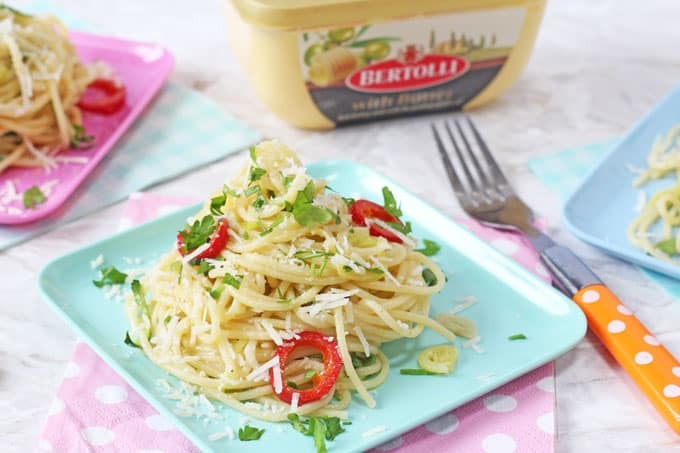 A delicious and super speedy spaghetti recipe made with Bertolli with Butter and with a hidden veggie twist! Regular readers will know that when it comes to dinner, I’m all about speed! Most afternoons are hectic in our house. Between school pick ups, activities and work I’m often left scrambling to whip up food at 6pm for my hungry brood. 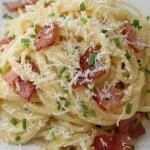 Quick and easy pasta dishes are a saviour on days like this. 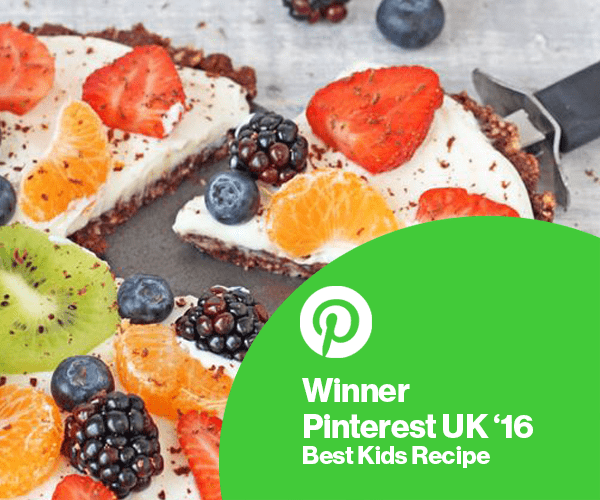 My kids adore spaghetti and it makes mealtimes a lot easier when I know that they are going to actually eat their food rather than push it round the plate! As a student I pretty much lived on jars of pasta sauce and to be honest its kinda put me off them for life. 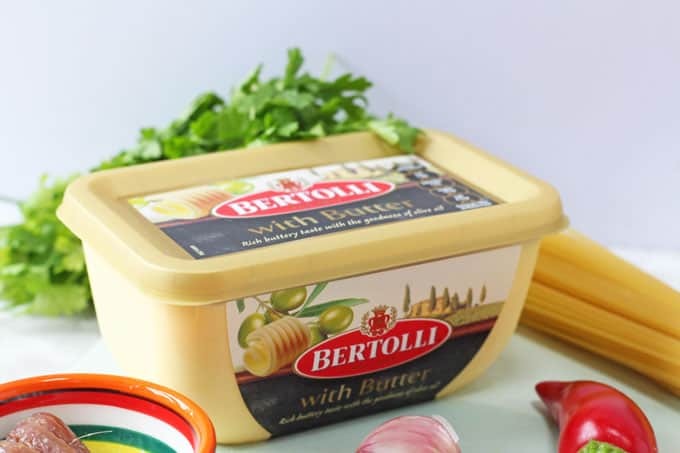 Nowadays I much prefer to cook fresh sauces for my pasta and so when Bertolli got in touch to see if I wanted to try out Gennaro’s Speedy Spaghetti made with Bertolli with Butter, I couldn’t wait to give it a go. This recipe really is so easy to make. It contains just a few simple but fresh ingredients. Whilst the spaghetti is cooking the delicious sauce can be whipped up in just a couple of minutes by frying the anchovies, garlic and chilli in Bertolli with Butter and some olive oil. I have to say I was a little sceptical about the anchovies and chillies and how they would go down with the kids. But my daughter had a couple of her school friends round for tea and I thought this would be the perfect opportunity to test the recipe out. The anchovies melt down completely into the Bertolli and olive oil, forming part of the sauce but leaving no trace, only a very subtle taste. Perfect for picky eaters! I cut the chillies quite big so they could easily be picked out for the kids but left in for the adults. Amazingly one little girl actually ate them all up! You all know by now that I am a bit of a stickler for getting as much veggies into my children as possible and so I decided to put my own spin on Gennaro’s recipe by hiding a whole courgette in this dish. 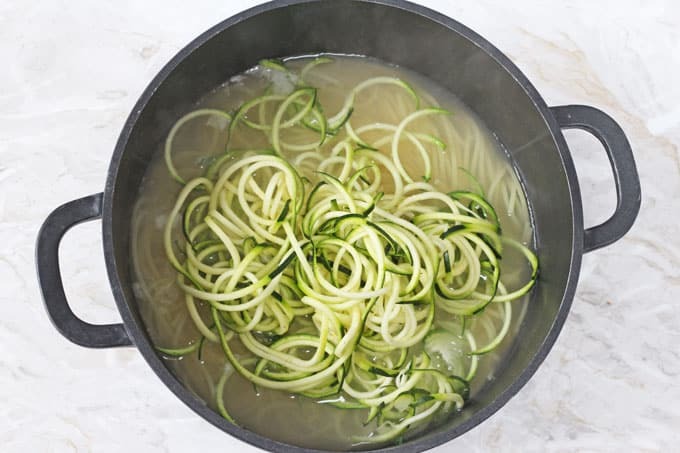 Using a spiralizer, I made spaghetti-like noodles from the courgette and added them to the pot with the spaghetti for the last couple of minutes of cooking. I love to eat pasta meals with a big bowl of salad on the side but my kids aren’t so keen, so this is a great way of sneaking extra veggies and extra nutrition into their meals. If you don’t have a spiralizer, don’t worry. You can get a very similar effect from a julienne peeler, or use a regular vegetable peeler to make ribbon-like noodles. And if you are worried about your kids noticing and picking out the courgette, simply peel it before your spiralize it. This will get rid of the green outer layer, leaving you with just white noodles that will blend in completely with the spaghetti! 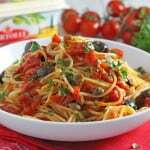 To see this and many more pasta recipes by Gennaro, check out Bertolli’s recipe page. 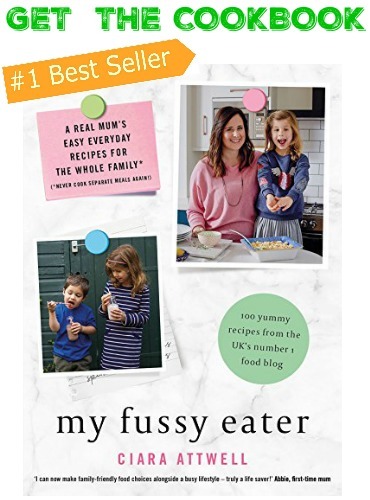 All his recipes are authentic Italian but so quick and easy to whip up at home, allowing you to show pasta some passion any day of the week! If you try this or any of the recipes share them on social media using the hashtags #BertolliWithButter and #ShowPastaSomePassion. I’d love to see your creations! 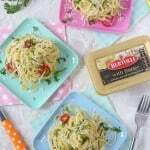 A delicious and super speedy spaghetti recipe made with Bertolli butter and with a hidden veggie twist! Place the spaghetti in a pan of boiling water and cook according to the package instructions. 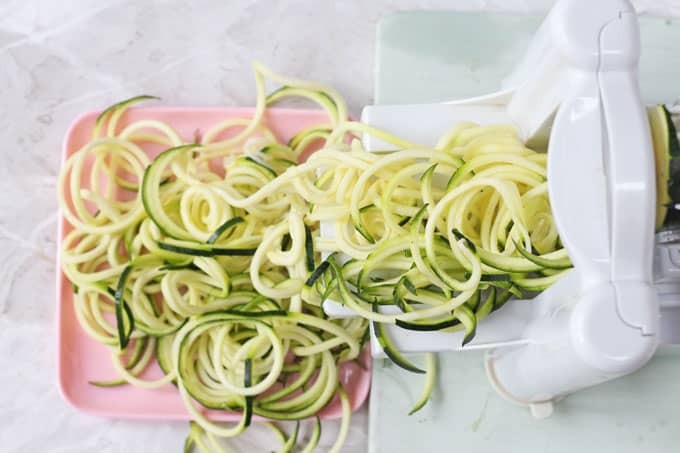 Make noodles with the courgette using either a spiralizer, a julienne peeler or a regular vegetable peeler. Prepare the rest of the ingredients by slicing the garlic and chilli and chopping the anchovies and parsley. Melt the olive oil and Bertolli with Butter in a large pan over a medium heat. Add the anchovies and cook for a couple of minutes. Add the garlic and chilli and cook for another minute. In the last couple of minutes of cooking the spaghetti, add the courgette noodles. Then using a tongs, transfer the spaghetti and courgette straight into the pan with the butter sauce. Mix well, adding a splash of the pasta water if necessary. Remove from the heat and mix in the parsley. Sprinkle on the grated pecorino cheese and add a final knob of Bertolli with Butter on the top. DISCLOSURE: I was compensated by Bertolli for my time spent making and writing up this recipe. All views and opinions are however my own. Really good and so simple to put together too. 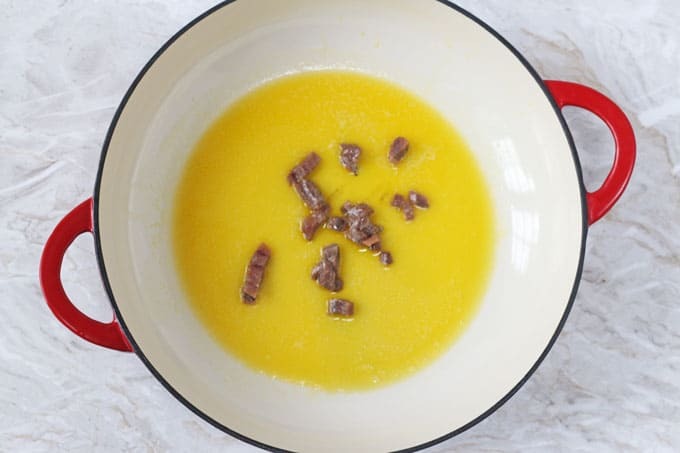 A new favourite recipe for us! I love Bertolli and Gennaro. I met him at The Big Festival a few years back and he is so lovely. I think his Bertolli recipes are fab, trying some next week actually. This looks delicious. It seems everyone has met Gennaro except for me. I’m jealous!!! This is such a clever idea. I love sneaking veggies in too, you’ve inspired me to try using some more bold flavours like anchovy and chilli for the children. Looks gorgeous as always! Thank you Sarah. I was so surprised the anchovies. I think its because they break down when cooking so you can’t see them! Yum! This reminds me of a dish my dad made a lot when I was a kid. So simple but delicious. I’m a big fan of adding the courgetti to my spaghetti too and I know it would work well with this buttery sauce. I’ll def be trying it out on my boys! Thanks Amy. I’m all for hiding veg in my meals!!! 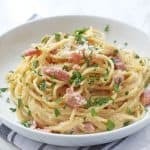 I absolutely love Gennaro Contaldo’s recipes and last year, I was lucky enough to meet the man himself for a pasta class and he made a few dishes with Bertolli with butter. What a feast! I wish I could have the Pasta King in my house every day! 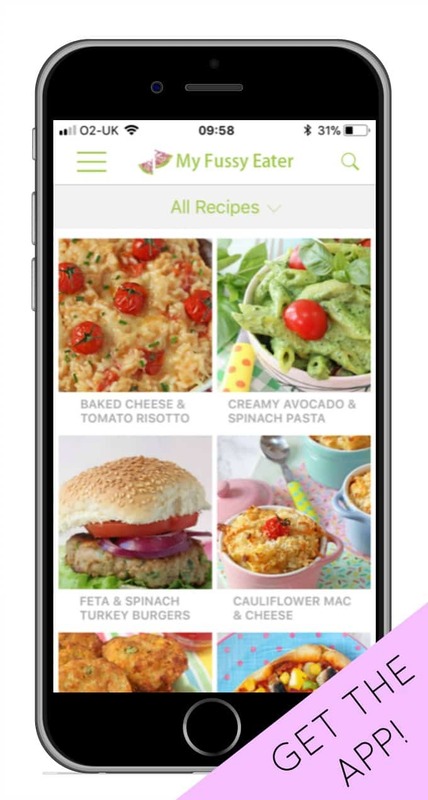 I love your twist on the recipe and would never have thought of adding spiralised courgette to the spaghetti. You’re a genius, Ciara! I shall be trying your trick soon! Just need to get a spiraliser! Wow you lucky thing! I’d love to meet him. He’s one of my favourite tv chefs! 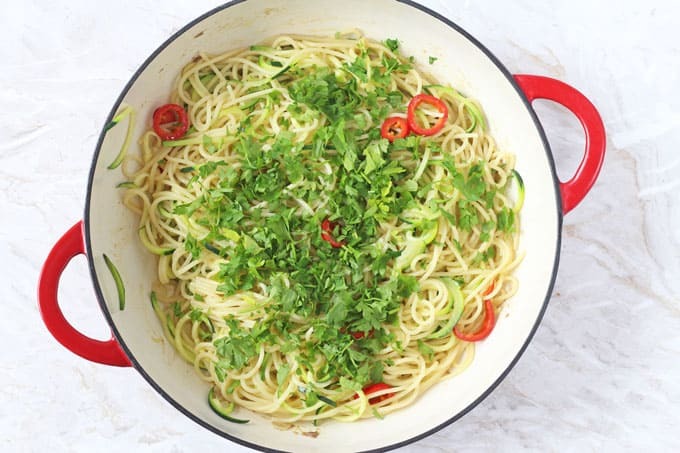 This looks great, I love how you added the courgette noodles,sneaky veggies are the best! 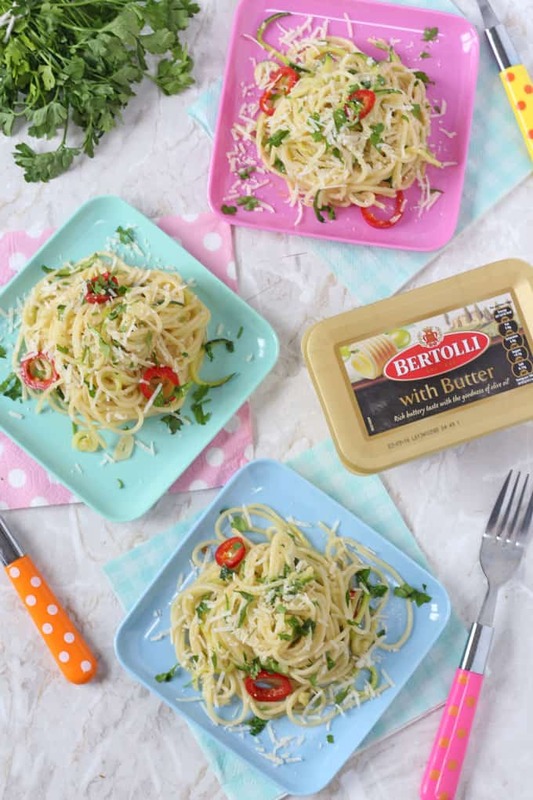 We tried cooking with Bertolli fairly recently too and really liked how it added a lovely buttery taste to the pasta. Its delicious isn’t it. So much better than nasty jars of pasta sauce! This looks delicious!!! I will definitely give it a try. I rarely think about courgette spaghetti, what a great idea to mix them with standard spaghetti, loving it. Thanks for sharing. Thank you Helene. Let me know if you try it! 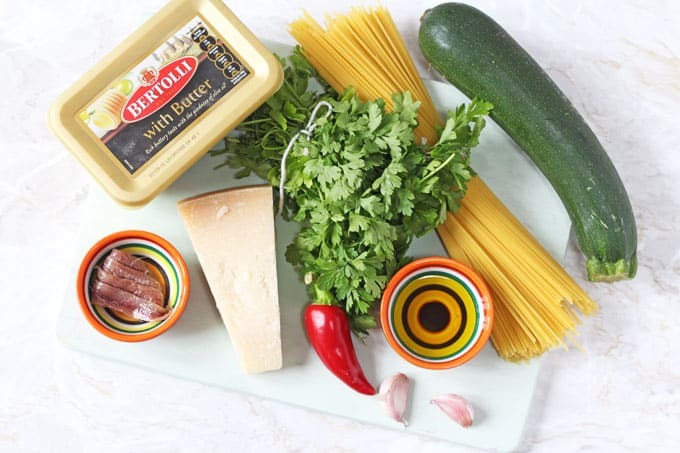 I love Bertolli and courgette noodles, so this sounds like an amazing dish! These simple and easy dishes are always the best! I had the pleasure of cooking pasta with Genarro once, a really fun experience! Oh you lucky duck!! I bet that was so much fun!